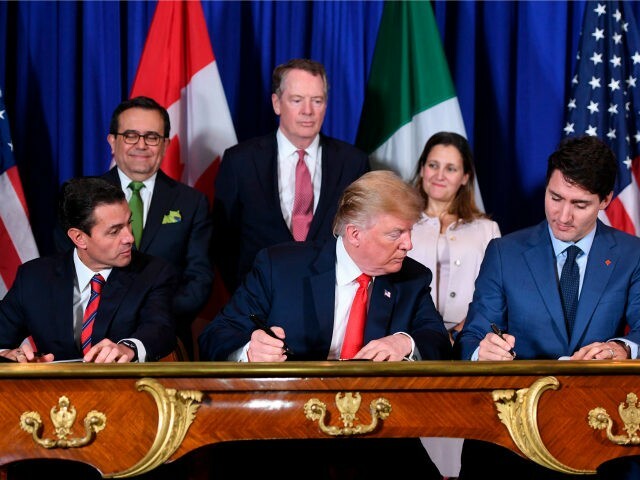 Canadian Prime Minister Justin Trudeau refused to say the name of the new “USMCA” trade agreement during a signing ceremony with President Donald Trump and Mexican President Enrique Peña Nieto in Buenos Aires, Argentina, on Friday. Trump spoke first at the signing ceremony for the three presidents to sign the United States-Mexico-Canada Agreement (USMCA) — a revamp of the North American Free Trade Agreement (NAFTA), based on Trump’s urging. Trudeau — with whom Trump has had a rocky relationship — spoke next and conspicuously avoided calling the new agreement by its name, “USMCA,” a name that Trump came up with. Nieto spoke after Trudeau. He referred to the agreement as the “USMCA” twice in his remarks. It was Nieto’s last day as president, and he touted the benefits of the new agreement. There was a question as to if Trudeau would show up to the signing ceremony. He and Trump have had a tense relationship, stemming from the G7 meeting in June. Trump accused Trudeau of holding a press conference that bashed him right after he left the summit.